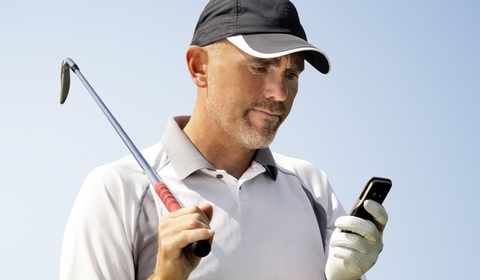 With Albatros SendSMS, you will be able to send confirmations of tee times or information about tournaments to a potential target group with personalized data but nevertheless in serial form and at the touch of a button. Sending text messages is a modern, fast, cheap, and effective communication channel. You can use text messages as a tool for membership management and customer retention and thereby emphasize your service orientation. Who wouldn’t be pleased to receive an SMS with birthday wishes? In the membership administration, you can specifically select members or guests and address them via SMS. Inform paticipants of the last seminar about the visit of Tiger Woods. Inform a specific group of users about special promotions – select them according to region, preferred tee times or other criteria. Numerous possibilities wait to be discovered. Instead of calling your members to inform them about tee times for the next tournament, you can rely on the SendSMS module which automatically sends SMS to all participants. The same applies, of course, to the delay of tee times, for instance when a shotgun start has to be postponed for two hours because of a thunderstorm. Customers, members, and guests are well informed and feel to be in good hands. In case that the service is offered, on average 70 per cent of the players use it. Your employees’ workload is reduced so that they can address other tasks. Little effort, great effect! The cellphone number has to be entered into the membership adminstration and the participation in SendSMS has to be confirmed by ticking the box. Guest players can participate as well once their data has been added to the master data management. The text messages can contain up to 160 characters, the dispatch is recorded and can be financed by sponsors. Consequently, SendSMS can be used to increase sales. 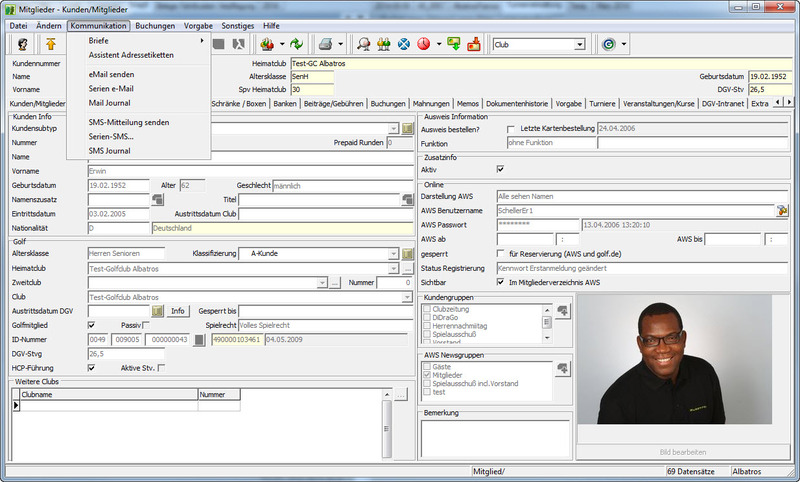 The SendSMS Module is one of the most frequently used Albatros Service Modules. 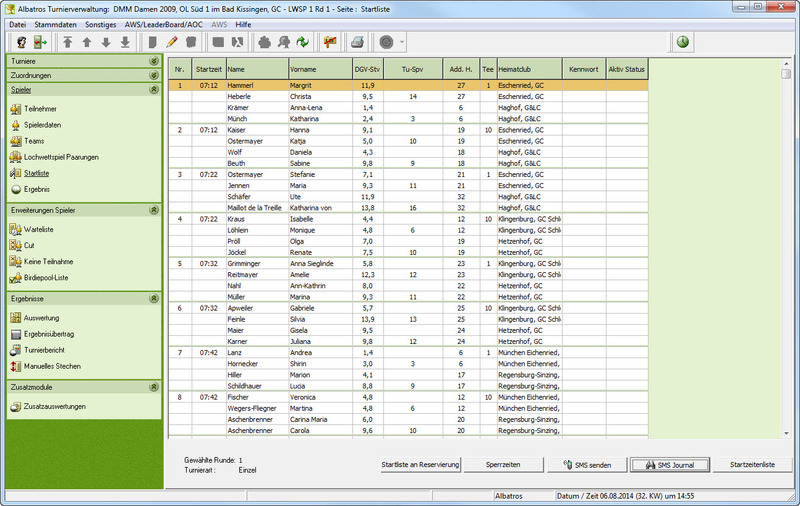 It presents a simple and fast possibility to inform your customers about tournament tee times and delays. An SMS message costs as little as 12 cent, which will be debited from a prepaid account. You can pay an SMS credit into your account (240 Euro = 2000 SMS) and as soon as it is depleted, we will refill your account and send you the invoice. 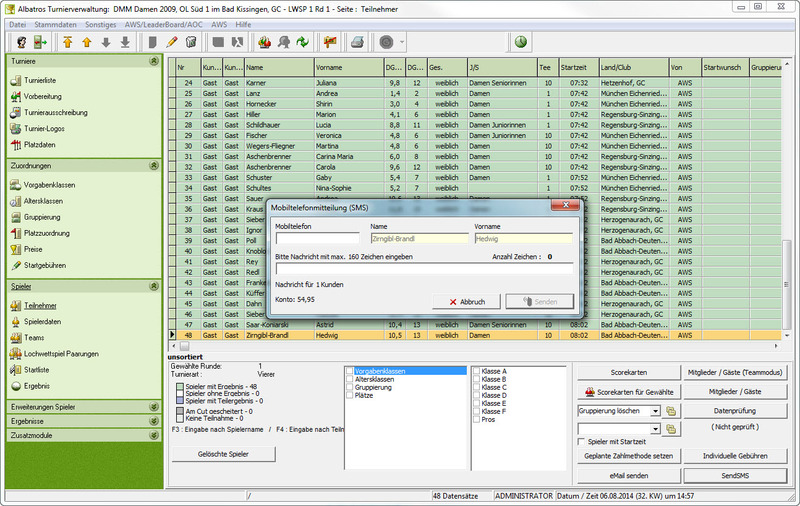 The SendSMS Module is an integral part of the daily customer service and tournament organization of the GC Neuhof. The Attighof GC uses SendSMS in order to rapidly spread information for instance tournament start lists. The HLGC Hamburg Hittfeld offers an excellent customer service including SendSMS.